Microsoft needs to aggressively move users from Internet Explorer to Spartan. Graphic by Slate, components from Wikipedia, Shutterstock. Internet Explorer has been a fun ride. We’ve laughed, we’ve cried, and we’ve made some jokes about grandparents. But now it’s time to roll out a retrospective video and call it a day. Internet Explorer has become a liability, and I’m happy to report that Microsoft seems to know that. On Wednesday, the company announced Windows 10 and a bunch of other new products, including a new browser code-named Project Spartan. The browser has some cool-looking features like a note-taking mode for annotation and collaboration, a reading mode and built-in reading list, and artificial intelligence powered by Cortana to (supposedly) make browsing more intuitive and fluid. It all sounds solid. Microsoft hasn’t explained whether Spartan will fly solo or be one of two standard browser options in Windows 10 along with Internet Explorer. 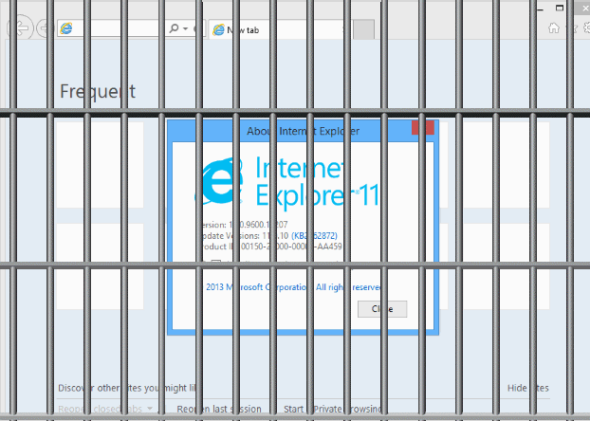 But pretty much everyone seems to be hoping that Internet Explorer will die with Windows 8. First released as part of Windows 95, IE became a star of the browser world. It pushed Netscape Navigator out and had a 95 percent market share by 2002. 95 percent. IE6 (released in 2001) was so popular that Microsoft didn’t update it for five years. That was a weird decision and made it less popular. And when IE7 finally came out in 2006, other browsers had started moving in. Those new browsers had the advantage of being open-source. Firefox, for example, is totally open, and as Ars Technica points out, Chrome, Safari, and Opera are all open-source at their cores, even though some aspects of their specific presentations are closed. Microsoft never went that route with IE. To this day it doesn’t even support extensions or have non-Windows versions. Since the announcement about discontinuing support, and perhaps because of some security issues, IE use has steadily declined. When I checked IE 6 use in August, it had 3.52 percent market share (that’s a version from 2001 we’re talking about.) Now it’s down to 1.08 percent. Good work, everyone. Microsoft needs to continue its process of euthanizing IE. With so many outdated versions of the browser floating around, the potential compatability and security problems are immense. So Microsoft has a little less than a year to rein this in and get everyone excited about Spartan. It honestly doesn’t seem hyperbolic to call the end of support for Windows XP a disaster. When Microsoft realized that it needed to kill XP off for real, it suddenly had to confront a huge population of mostly oblivious users. Hopefully the company learned from that, and will get the word out as it decisively wipes Internet Explorer from the digital Earth.